When it comes to storing tires in your garage, there are several variables to consider including the space available, the weight of the tires and your physical ability to use the storage system. The typical car tire weighs between 16 and 24 pounds. Add a rim to that, and now it weighs between 30 and 40 pounds. If you want to store your tires overhead, you have to be able to lift that amount of weight. Both of the following solutions need someone to hoist a tire up for a few moments. 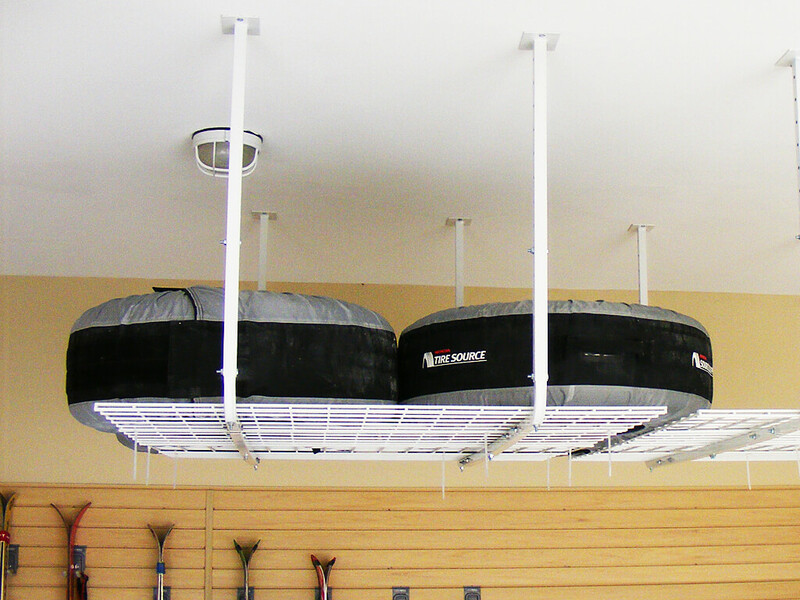 The most common way to store seasonal tires is in a steel rack suspended from the ceiling. It’s strong, secure and gets the tires out-of-the-way while leaving them accessible when you need them. This is a good solution for someone with one or two extra sets of tires. If you have multiple sets of tires, you might consider a platform. The platform can support more weight and larger items than the overhead rack. 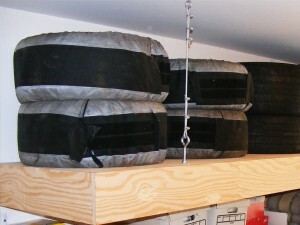 If you prefer not to lift the tires up, there are other storage solutions. If you want to keep the tires out of sight, cabinets are a good option. The cabinet depth and width need to be at least 30” to accommodate most tires. A tire rack against the wall is another option good for people who are unable to, or simply don’t want to, lift heavy tires. This option depends on what else you need to store and what sort of space is available. 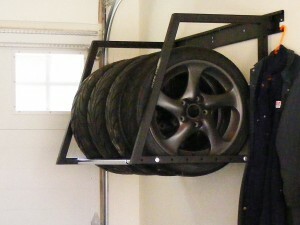 The racks are mounted to the wall and tires are suspended so there’s no pressure on the rubber. Another option, which I would only recommend for someone with a large garage who wanted a showpiece, is to install a hydraulic lift. It would sit flat against the garage wall, and lift the tires up. This gets the tires out-of-the-way, but it means you can’t store anything permanently underneath the lift. Aside from the hydraulic option, proper tire storage isn’t typically expensive and doesn’t take a lot of room, but you have to take both space available and physical ability into account to find the best solution for you.